Hello, crafty friends! 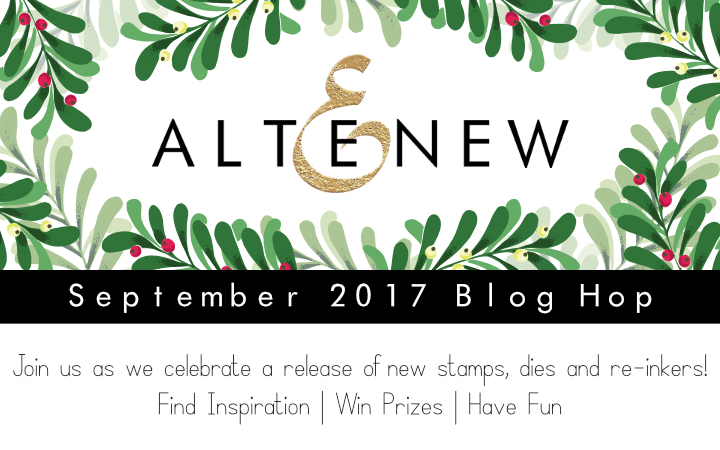 Welcome to the Altenew September 2017 Release Blog Hop Day 1! It's Dana here and I'm so honored hopping along with you today. I hope you are from Lilith's blog, but if not, please check the full blog hop list in the bottom of this post. To celebrate this release, Altenew is giving away a $50 gift certificate to THREE lucky winners! Please leave a comment on the Altenew Card Blog by Thursday, October 5th at 11:59 pm EDT for a chance to win. The winners will be announced on the Altenew Card Blog on Saturday, October 7th. I'll draw one lucky winner who will receive $30 gift certificate. Winner will be announced on my blog on October 6th. Ok, it's time to getting to my 6 cards. Let's get started! To start, I stamped maple leaves from Altenew With Gratitude Stamp Set onto white card stock using various dye inks. I firstly applied inks to solid stamp using mini daubers and then stamped it on the paper and repeated this process to another layer, too. Line stamps are gold heat embossed on vellum. I then die cut all my leaves using Altenew With Gratitude Die. I stamped sentiment from same stamp set onto beige card stock and cut it like tag shape using trimmer and scissor. I slightly sponged distress ink on the bottom of my sentiment tag. For my background, I stenciled tree ring from Altenew Tree Ring Stencil using texture paste on A2 sized grey card stock. After dried it completely, I ink blended outside the tree ring and edge of the panel using distress inks. I finished this card off by adding hemp cords and popping up the elements as shown in the picture using foam adhesive. In my second card, I featured Altenew Just Because stamp set. This stamp set contains two beautiful flower bouquets and I used bigger one today. First, I white heat embossed flower bouquet on A2 sized watercolor paper. I then watercolored them with distress inks. I used Seedless preserves, Peacock feather, Broken china and Wild honey. To create more dreamy autumn floral background, I splattered same distress inks with water using paint brush. I white heat embossed the sentiment from same stamp set and foam mounted it. To finish, I brushed left side of card and sentiment with gold drawing ink and splattered this gold ink here and there. It's beautifully sparkling and I love the result. Yay, another halftone series is revealed! As a fan of halftone stamps from Altenew, I have so much fun time using this Altenew Halftone Stars stamp set and I made 2 cards with it. For this card, I stamped stars from big to small one using dye inks onto A2 sized white card stock. I traced outlines with some blank space using pencil and ruler. I then colored outside of stars with Altenew Artist Marker S (black). I stamped sentiments from same stamp set with black pigment ink. Next, I trimmed a piece of woodgrain paper strip and wound it up with bamboo cord. It needed my patience but I love how it turned out perfectly as a part of my own blackboard. To finish, I mounted star panel and my strip on A2 sized white card base using glue. My second card using Altenew Halftone Stars stamp set is more easier to make. I die cut single stars and star frames from silver glittery paper using Altenew Halftone Stars Nesting Die. I stamped one of halftone stars with dye ink and glued it with big star frame. I then watercolored cloudy background using Peerless watercolor paints and stamped sentiment from same stamp set. I placed my stars where I wanted them and added some beads on a big star as shown in the picture. To finish, I mounted watercolor panel to A2 sized white card base. My last project today is holiday cards! These are 4-bar sized cards that I tried for my first time. 3 1/2' X 4 7/8' size is so cute but not too small and I'm in love with them! Altenew Happy Holidays stamp set consists of holiday sentiments and tiny images and I made my own Christmas tree with them. I stamped 'season's greetings' sentiment first and then stamped tiny images to triangle shape onto watercolor paper. I then applied watercolor paints from Gansai Tambi over the stamped images. After dried it completely, I splattered white acrylic paints with water to watercolor panel. To finish, I die cut small star from gold glittery paper using Altenew Halftone Stars Nesting Die and foam mounted it on the top of the tree. I made next card to graphic style using only sentiments from Altenew Happy Holidays stamp set. Sentiments of brown shade colors are stamped using Altenew Crisp Ink, Caramel Toffee and Paper Bag. I added hemp cord ribbon and mini jingle bell and finished this card off. I hope you enjoyed these cards. Your next stop is amazing Svitlana's blog! Thank you so much for stopping by and happy hopping! Dana Gong <- You are here! Wonderful cards... especially the Just Because card. Wonderful array of cards - TFS! Hard to pick a favorite, but I find that I keep looking at the one using With Gratitude (love it!). Wow, all of your cards are wonderful and unique! Your cards are awesome! I especially love the Give Thanks one! Those new leaves and sentiments are so fabulous! And I love the colors and textures you used in your design! Great cards!! I love all of them! Beautiful, colorful cards! 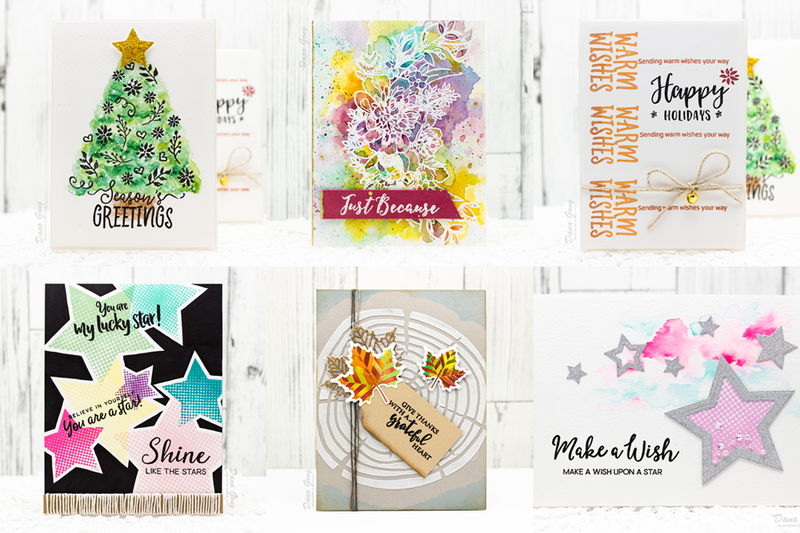 You've been very busy in your craft room creating such lovely cards! Awesome cards. Very unique! Thanks for sharing! Wow what a great post so inspiring! I absolutely love the water colour look! Great ideas. I love the Just Because stamp set. Beautiful cards! Love the watercoloring - its fabulous and so creative! I think my fav is the Just Because card! Oh Wow!!! You have been busy creating with these fabulous new items....I am so jealous!!! Every single card is Fabulous, my favorites are Just Because and Make a Wish. They are all so pretty!! What wonderful cards. Thanks so much for sharing. Love all of your cards! I can't pick a favorite! My favorite is the "just because card".Love that look. All of your designs are fabulous. Your leaf design really made me notice the beauty of this stamp set. TFS so any ways to use this new Altenew release. Wow, someone has been busy, great cards all of them, I love the first card with the leaves, stunning! All your cards are just gorgeous! Love the just because card! Wow! What a great set of cool cards! Autumn is my favorite, so your first card really drew my eye...Love it! Great 'loose' watercoloring on your floral, too! What great cards from beautiful sets. You gave me great ideas. Thank you for the inspiration. i like card with the sentiments from Happy Holidays Stamp Set!Looks cool! All are beautiful cards but the Just Because one with the watercolor background is stunning!! I love the halftone stamps too. Can't get enough of them. Oh my goodness - what an incredible selection of cards! Simply stunning use of the new releases! Each card speaks in it's own style and utilizes the stamps in unique ways. My favorite is the Just Because - I'm naturally drawn to that, the the thankful card is genius! I love them all and am truly amazed at your diverse perspective. Thank you for sharing your incredible talent with us. I'm hooked. Great release! I especially like you Just Because card! That really pops off the page!! each of your cards are adorable! Love each card, but the Just Because is outstanding. Thanks for sharing your creativity. Wonderful cards! I love how you built the Christmas tree from small images and watercolor. I ❤️ the riot of color for the background on your second card! Very lovely! Both of the Halftone Stars ✨ ✨ cards are pretty! Loving the black background on the first one and the second is delightful with the soft looking colors! I love your grateful card and the make a wish card! Tho they are all fabulous! Wonderful card designs. I like the tree ring on the gratitude card. I love your card with the Just Because set; it's already in my card, and I can't wait to watercolor it! Thank you for sharing all of these gorgeous samples! Such a great release with a wonderful variety of products. Each card is a mini canvas....a piece of art...but I love the With Gratitude card. Your water-color floral is amazing! wonderful variety of cards and inspiration! All these cards are sooo great and lovely !! You're very talented !! What a gorgeous cards, a real treat! I love most your beautiful card with the Just Because stamp set. Beautiful colours! What a lovely collection of cards! I really like how creative they are and they really showcased the new products well. Thank you for the chance to win! Gorgeous cards! The watercolor flower bouquet is amazing! Love your creativity! That Tree Ring stencil is fabulous! It did not stand out at all to me until seeing it used this way. Such inspiring pieces you've created! Great cards! Love them all but I think I like the Just Because card the best if I had to chose! The great watercoloring behind the stamp is just stunning! Your cards are lovely! This is another wonderful release with so much variety! My favourites are the Winter Rose and Just Because stamp sets. They're gorgeous! Your cards are great!! I only had two new items on my list but now you made it five as I'm inspired by how you used them!! Amazing cards. Thanks for sharing your creativity. Beautiful designs on your cards!!! Beautiful samples. This new release is great and the halftone stars is one of my favourites. What a beautiful assortment of cards. I couldn't possibly pick a favorite. Love your cards the floral and stars are my favorite! Your work is wonderful Dana. My first visit and I'm sure to come back. This release has so many great sets. You represented them well. Awesome cards, especially the half-tone stars and the script cards, love these. Thank you for the inspiration. 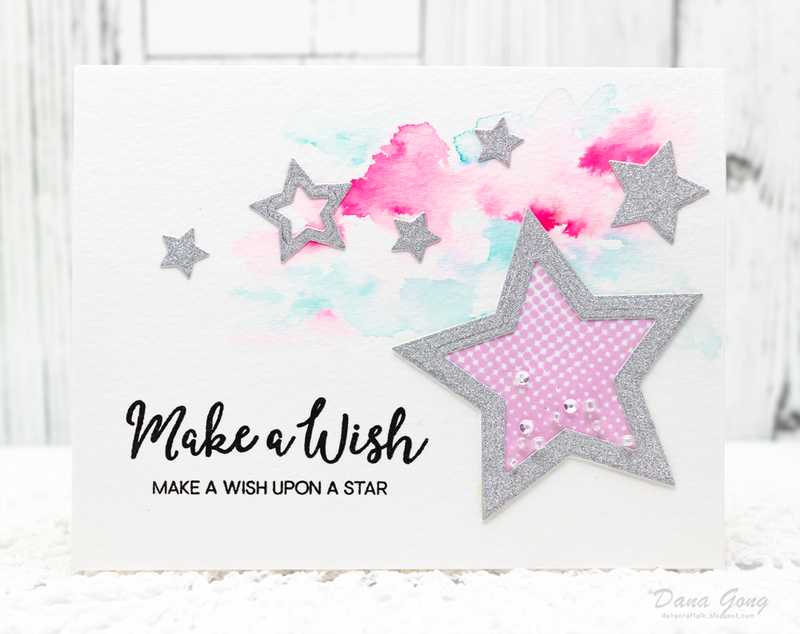 I'm normally not a big fan of pink, but the background for your Make a Wish card is just dreamy! 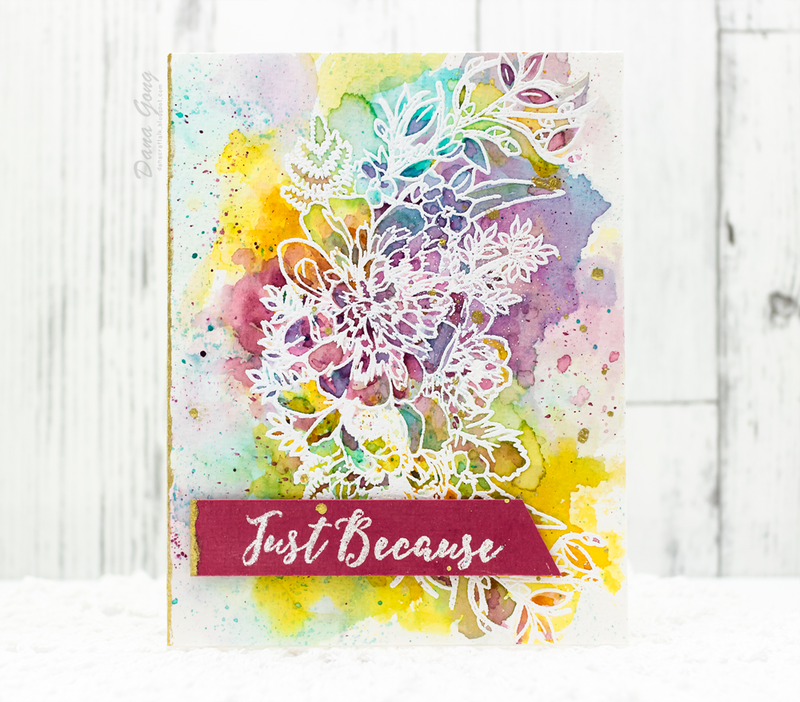 Wow, your cards are amazing, I love the watercolored Just Because card, and the Halftone Stars are awesome, and I love the texture paste Tree Ring stencil background for your gorgeous leaves. Wonderful cards. Thanks for sharing. I sure do love how you brought color to your cards! Love the leaves! 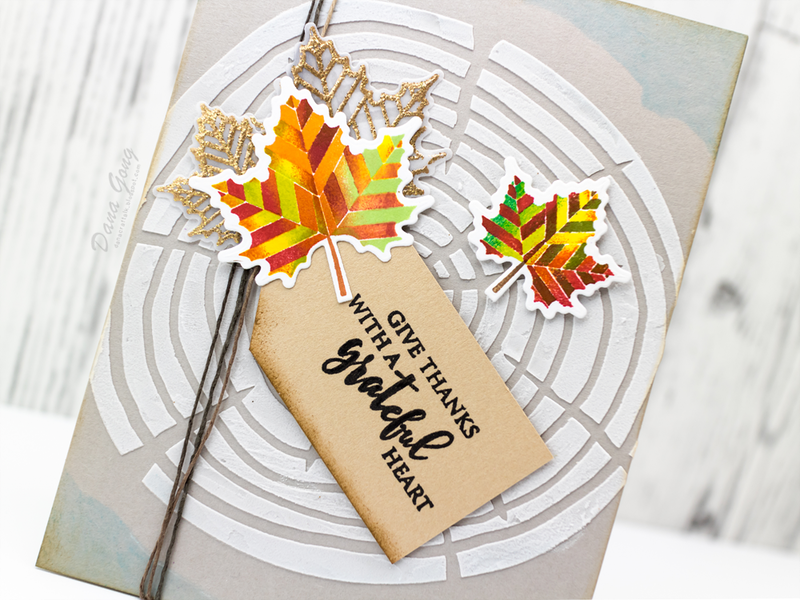 love love your autumn leaf card - so wonderful with the tree ring background! So many beautiful projects! The first two are my favorites, love the combination of the leaves with the tree ring stencil on the first card, and the watercoloring on the second is just stunning! Thanks for sharing all the cards. Wow...you've been super busy! All of your cards are lovely, but my favorite is the sweet Christmas tree. What a fabulous idea. I just love all your cards! The tree ring on the first card is such a cool idea. Thank you for sharing your talents! Your cards are so fabulous! I love your use of watercolor. I love the half-tone stars card! It's so cute! WOW, Dana, six beautiful cards! 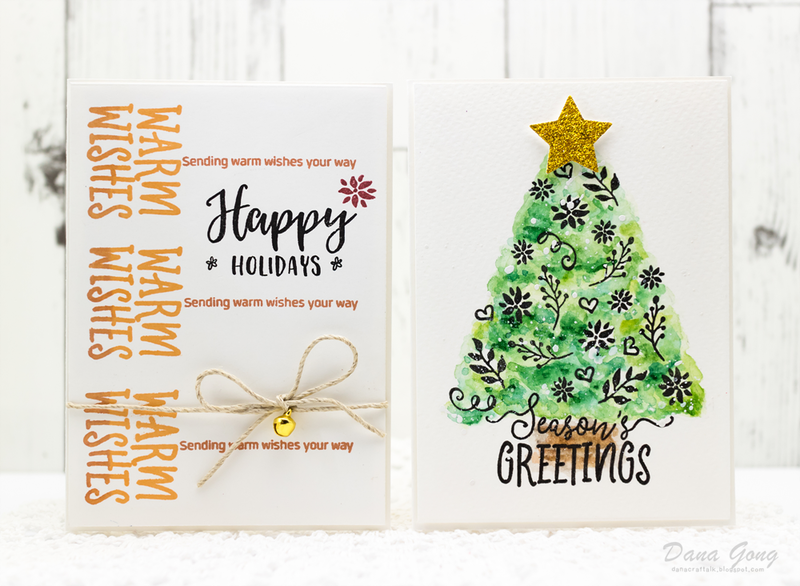 Each design is so unique and love what you did with watercolors on the Just Because card and your Season's Greetings tree design. Great hop! Wow so many beautiful cards. Such a great release and you showed so many wonderful examples. Thank you. Gorgeous cards! Love that pretty Christmas tree you created! Lovely! Stunning cards. The Just Because watercolour is absolutely gorgeous. I love the watercolours, so lovely. I also like your black star card - very vivid and eyecatching. So many wonderful cards! I especially love the bright stars on the black background! These are all wonderful but I love the way you used the tree ring stencil and combined it with stamps for your Grateful heart card. I could not stop pinning your cards they are so inspiring! With such an amazing array for new products, how do you stop! You did some beautiful new cards. Ok, there's too much to comment about here, but here goes the condensed version! I love the tree rings behind the leaves: perfect background. Check! 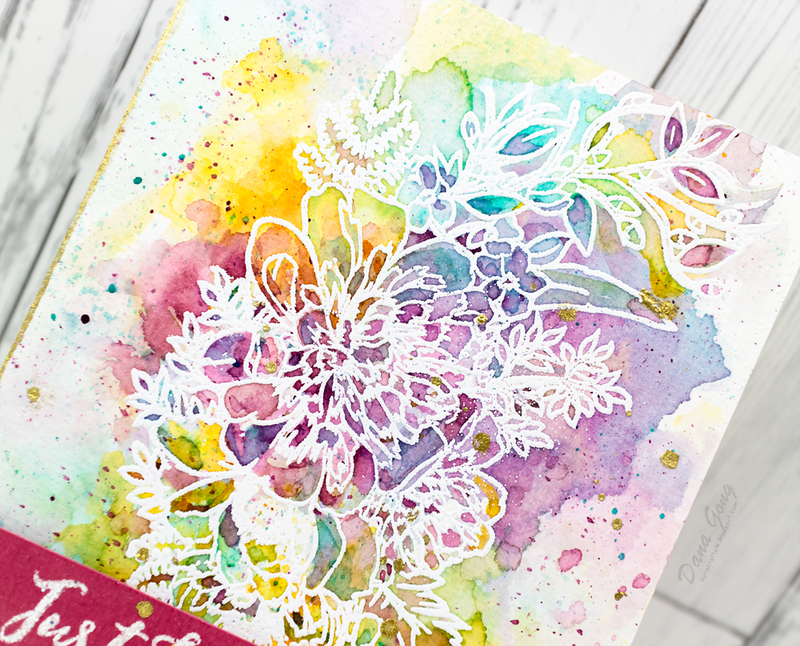 Love that floral spray, and what a fun way to color it! Check! The stars are so much fun (and especially adorable on the colored clouds). Check! and The Christmas tree rated a very appreciative "A-w-w-w-w-w!" It is such a fun tree. Thank so much. Your designs are very creative and new. Your watercoloring with the distress inks is truly lovely. Great job with the new release. WOWZERS Dana, I am nearly speechless! I could write a book about all of these beauties, instead I will save us both some time.... They are all AMAZING! WOW, what a release! Hello! I just love the Christmas tree card! All the cards you made are wonderful, but the Christmas tree is my favorite. Love your cards! My favorite is the Make A Wish card with the stars! Thank you! These cards are all so pretty! I especially LOVE the maple leaf coloring!!! Thanks for sharing! My, you were busy! I love every card and I LOVE this release from ALTENEW. I think each release gets better and better, which means my bank account gets smaller and smaller. So many beautiful cards to inspire! I can't pick a favorite,but I do really like how you used small stamps to fill in your Christmas tree and the watercolored the tree. So many fabulous cards! I love all the different techniques you used. Love all your Beautiful Designs. One release - many different styles to create! The expanse of different looks is just brilliant here. Love it! Thanks for sharing! Loved all your cards! I especially liked the texture paste background on the first. Great variety of cards...esp love the first with the tree rings. What lovely cards you have made! 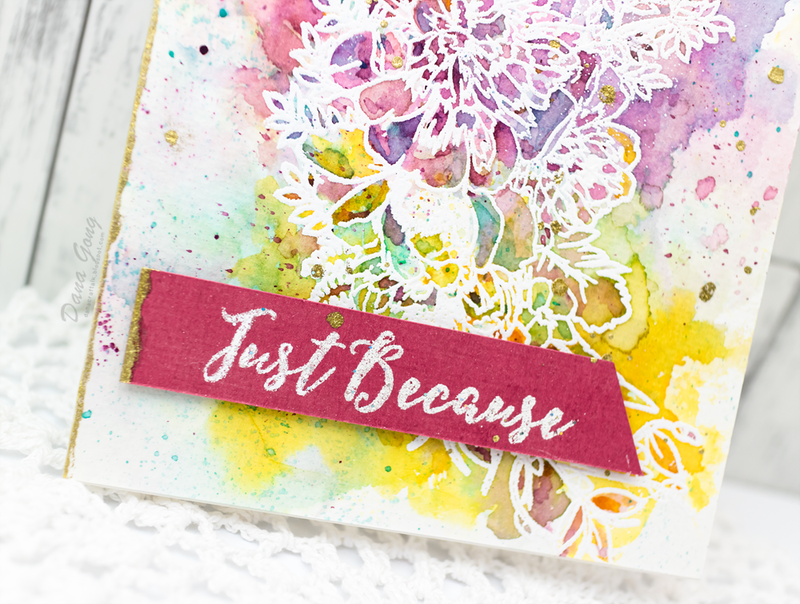 I really love your use of watercolor, especially on the colorful Just Because card. Wow! Beautiful cards! I LOVE each one! I love how the leaves look, one of my favorite sets. Those are some great examples--great creations!! Thanks so much for sharing! Lovely cards! Very creative embellishment on the black card with the paper wrapped with cord. You are very talented! Beautiful! 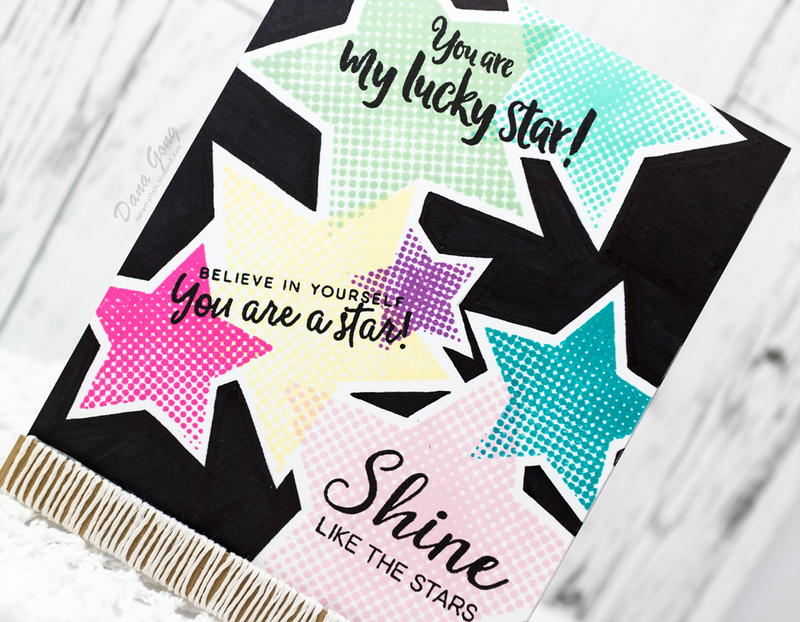 I'm in love with Halftone Stars stamp set! Great cards! Love that little Christmas tree! Beautiful! Thanks for sharing your talents! Fabulous ideas. Love the white flowers on the watercolor background. Love the autumn leaves and the watercolor bouquet!! Great cards, my favorite is the tree you painted. I love how you showed us a bit of everything in your post, thanks for sharing!! I certainly enjoyed viewing all your fabulous creations. Very inspiring! Thank you so much. You were super busy! So many nice cards! The thankful card has such pretty leaves and I really like what you did with that Just Because bouquet. Gorgeous creations. Halftone stars stamp set is quickly becoming one of my favourites. Wow you did an amazing job show casing this new release. I just love them all. Thanks for sharing all these wonderful cards and inspiration ! I am inspired to try watercoloring my own Christmas tree card. Love your idea of the tree rings. The Christmas tree is wonderful. All the cards are great. Beautiful cards. My favorite is the one with leafs. I like how you stamped the leaf onto vellum and then used the tree stencil as a background. Your Just Because card is very colorful - just like flowers are- well done. And I love how you decorated your tree. Hi Dana, I love your cards, especially the Just Because card! Your backgrounds are amazing! I'm in love with your cards, very inspiring! Now there are just more things on my have to have list! Thank you!! What beautiful cards. 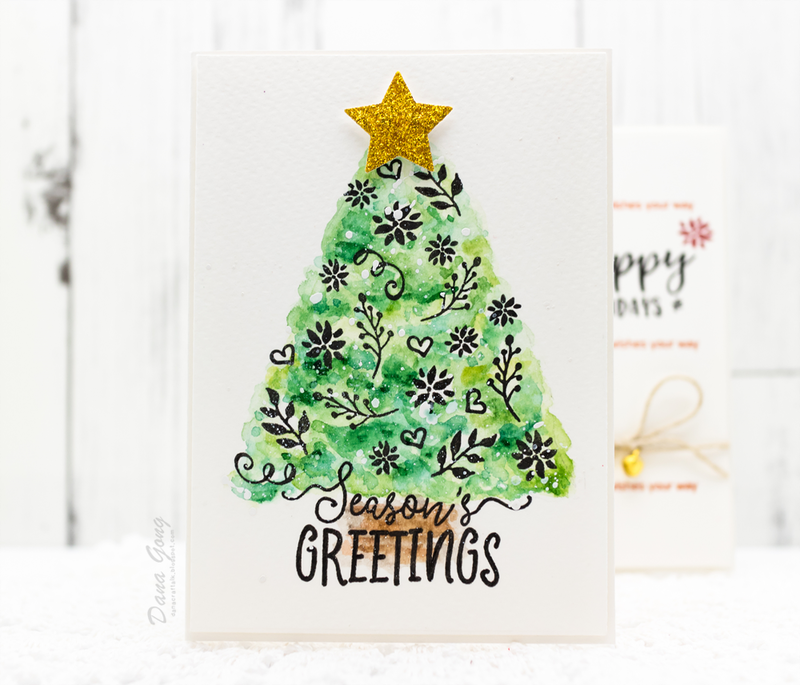 My favorite is the Christmas tree -- love how you used the small shapes and your own watercoloring to make a very pretty tree and card. Thanks for sharing. Love the just because card! Thank you for sharing so many projects with us. They are terrific. Beautiful cards! Love the all the colors and the gorgeous leaf card. So pretty and perfect for fall! The black coloring behind the stars is amazing! It looks like black paper! Beautiful examples with this release. These cards are stunning! I love the second colourful card! Your Just Because card is gorgeous! Love all your cards! Thanks for sharing! all very different but wonderful cards!! Very lovely and beautiful cards!! Your cards are simply gorgeous!! Love all thes stars cards. And the flower and leaves so amazing..
Beautiful cards and designs!! I love how different they all are!! Your work is over the top! I loved all of your projects. Wonderful cards. Just Because is my favorite of the new releases. Wonderful array of ideas Dana! Love all of them but the distressed background and the playful halftone star designs are my favorite! Thanks for sharing! Love your cards! Great texture, lovely watercoloring and some great ideas. Thanks for sharing! Vet these stars and fewer eaves card your coloring are amazing.. you cards are amazing. Wow, so many awesome cards, love the autumn ones most! Wow! Thanks for such amazing inspiration! Each and every one is a gem! Loving the new release! Beautiful cards. So festive. Love this new release! So beautiful and creative. Love your work! You selected such a variety of techniques to make your cards. They are stunning! Ok yes please!!! Those backgrounds are to die for!! I love the pop of the fall leaves and especially the pattern in the leaves!!!!! Absolutely beautiful work!!! Wow! These are all so beautiful! Love the coloring on the one floral card! LOVE your designs, they ALL EXCITE and DELIGHT! O wow, you've been busy crafting away!! You've showcased these stamps and die sets fabulously!! I especially love your first card. It's so creative with your beautiful leaves on the tree ring like that. I also really like your colourful and cheery halftone stars card. Welcome to the Dana G. Crafts! I'm Dana - Hello. I'm Dana Gong and I'm sharing my handmade cards here. I hope you got inspiration from my blog filled with lots of creative ideas and tips. Heartfelt thanks for stopping by today!